Generally speaking, the last thing anybody wants is a book waving a "practical" banner. But practical can also be informative and funny, especially when it comes to bears. Linda Masterson, an award-winning writer and volunteer for the Colorado Division of Wildlife’s Bear Aware team, has succeeded in converting what could have been a boring how-to manual into a delightfully good read. As renowned bear expert Tom Beck notes in his foreword, bears are "the most engaging subject matter I know of." 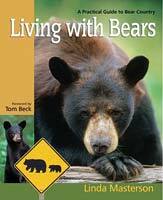 Living with Bears is packed with photos, anecdotes, and every imaginable tip useful to people who live or vacation near black bears. "It’s a good idea to have a super-soaker water gun on the kitchen counter in order to saturate a bear in the snout if he dares to come towards the window when dinner is being prepared," she writes. "Or maybe an empty bean can with little pebbles inside which, when brushed aside by a bear attempting to enter a home, will sound exactly like a rattlesnake… bears are deathly afraid of rattlesnakes …"
Masterson takes us on a journey through a bear’s universe. We learn how bears think and should not be surprised to find that they’ll outsmart us every chance they get. Masterson convinces us of one important fact: Although they’re big and intelligent, most black bears are basically fraidy-cats. They scamper off when a child defends his birthday cupcakes or a 90-year-old woman shakes her soup spoon at them. Bears have adapted remarkably to the overcrowding of the planet, carving out a niche right under our noses. Bears know how to survive; we can only hope to learn a few lessons from them.